S’mores are one of those all-American foods that people outside of the United States, for the most part, do not understand. 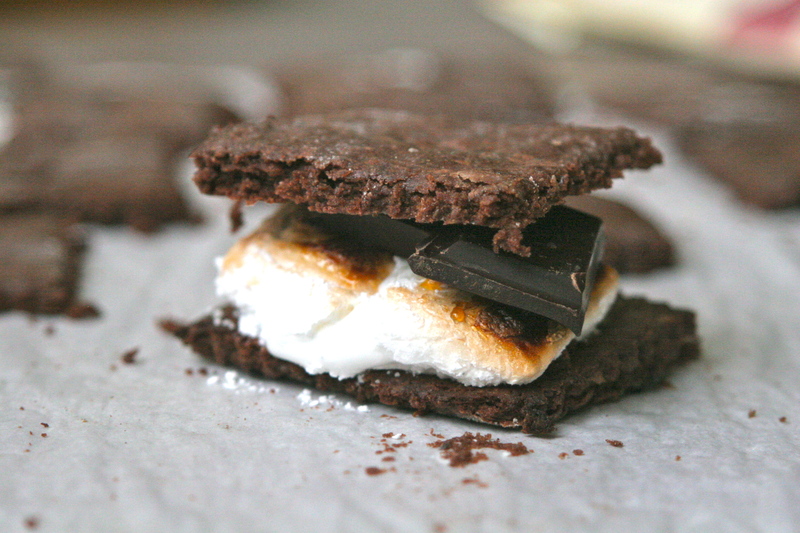 Beginning with the “jet-puffed” marshmallows, moving onto the dry cookie “graham cracker,” and finishing with a slab of gritty, vegetable oil-based Hershey’s chocolate, it is clear that whatever good is in the average campfire S’mores confection results from the sum of its parts. Despite the shortcomings of the humblest S’mores creation, they evoke an apple pie brand of nostalgia that reminds me of father-daughter camping trips, beach barbeques with friends, girl-scout summer camp, and the blissful feeling of being outdoors with people I love. 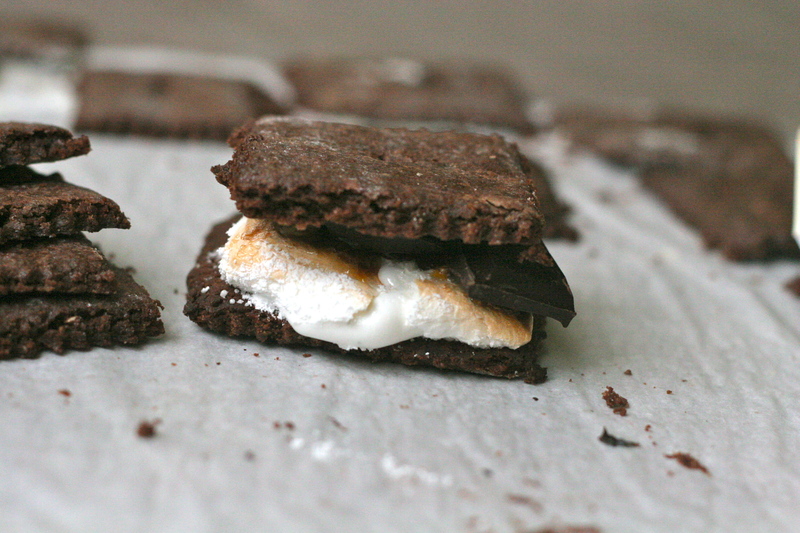 Bliss or no bliss, over a decade ago I set out to change the way I consumed S’mores. I should begin by stating that I am not a wild fan of untoasted plain marshmallows. I love gussied up Rice Krispy Treats and I love that faux marshmallow sauce (homemade) that goes on fruit salads and the like, but a plain supermarket marshmallow out of the bag is just not for me. As a blurry eyed freshman university student living in the dorms, I decided one fall evening that I needed a break to prepare me for the next umpteen hours of studying. My roommate had a bag of marshmallows. I had in my possession four pristine dark chocolate bars that my mother had mailed me in a care package full to the brim. After a quick trip to the school store, we had graham crackers. But how to roast our marshmallows in a dorm room? Being the rebel that I was, I illegally struck a match and lit up a……candle in my room. Need I emphasize how extremely dangerous and cool (dare I venture messianic) I was? Thus began my almost-weekly S’mores club where a group of my buddies and I would come together with a couple of matches, to slowly candle-roast marshmallows with a coat hanger and combine them with the very smoothest, darkest, chocolate that we could get our hands on (read: that my mother would send us for this express purpose). Being the worldly and insightful college students that we were, each of us brought some sort of esoteric music track to listen to week to week. It was a wonderful way to avoid studying and gain those “freshmen fifteen” on worthwhile calories–not just dorm food. Fast forward to the next millennium. I began adoring Michael Recchiuti’s insane chocolate creations shortly after finishing school. Peanut butter pucks, burnt chocolate hazelnuts, and fleur de sel caramels fill our shopping sack every time. Now I have the lovely book he published several years ago and we make monthly visits with my kids to visit their beloved chocolate buddy, Susan, down at the ferry building. My son usually chooses the sesame nougat chocolate and my daughter the largest piece she lays her eyes on. And though I never let them (hey, they are expensive! ), up until a year ago they always begged for one of the marshmallows. 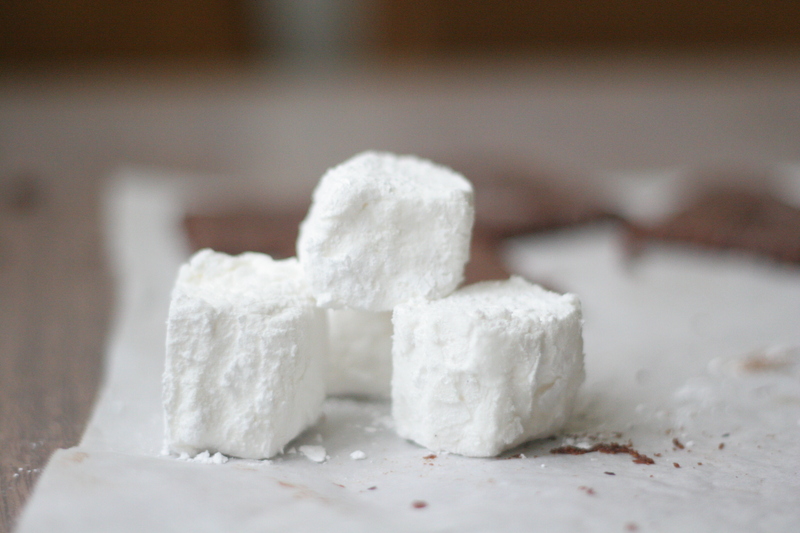 Seeing as Recchiuti includes his recipe for Tahitian vanilla bean marshmallows in his book, I decided that I would treat my kids to homemade marshmallows and save a bit of cash. Now well over one year, a dozen batches, and many sticky fingers later, I am one of the biggest marshmallow fans around. No store-bought marshmallow can ever compare to the warm and gooey inside and crunchy, toasty, caramelized outside of a roasted homemade vanilla bean marshmallow. Not. Even. Close. 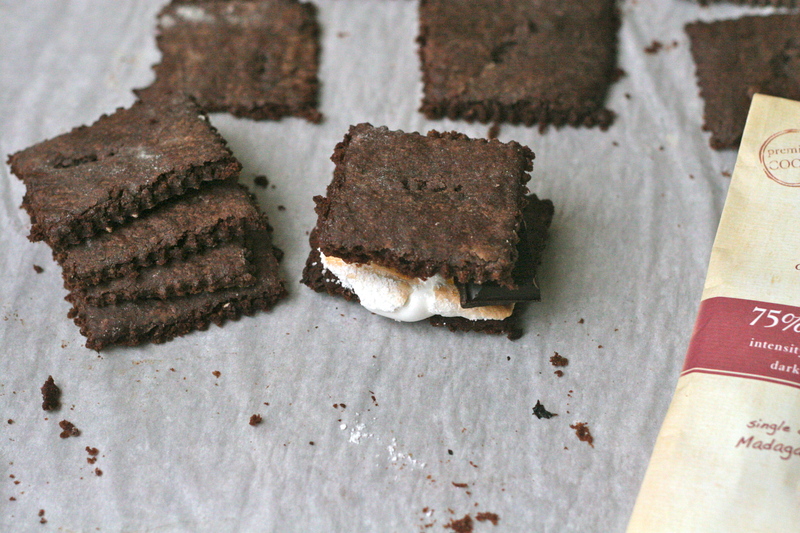 The chocolate graham crackers came from a different sort of craving. I have made homemade graham crackers twice now and they are quite good. 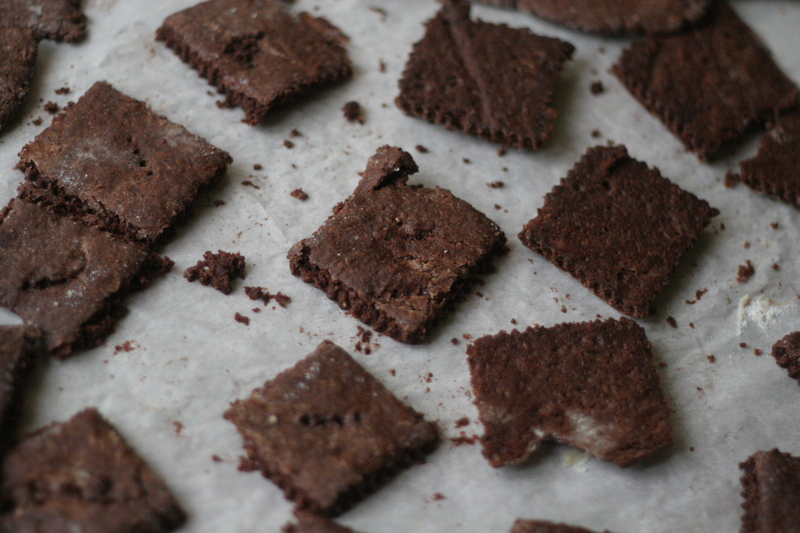 However, yesterday what I had in mind was more of a blackout chocolate graham cracker cookie made with real graham flour. What resulted from my experiment are my new favorite cookie. If rolled 1/16 inch thin, which seems impossible as you are doing it, you end up with a crunchy cookie, perfect for the Smore’s. If you only roll it say 1/8 inch thick you end up with a slightly softer almost brownie-like cookie, but with a deep dark chocolate taste and a slightly toothy crunch here and there from the graham flour. They are so addictive you could crunch them up and use them for a tart crust for a dark chocolate tart or cheesecake, or even spread some softened ice cream between them and freeze for the ultimate ice cream sandwiches. 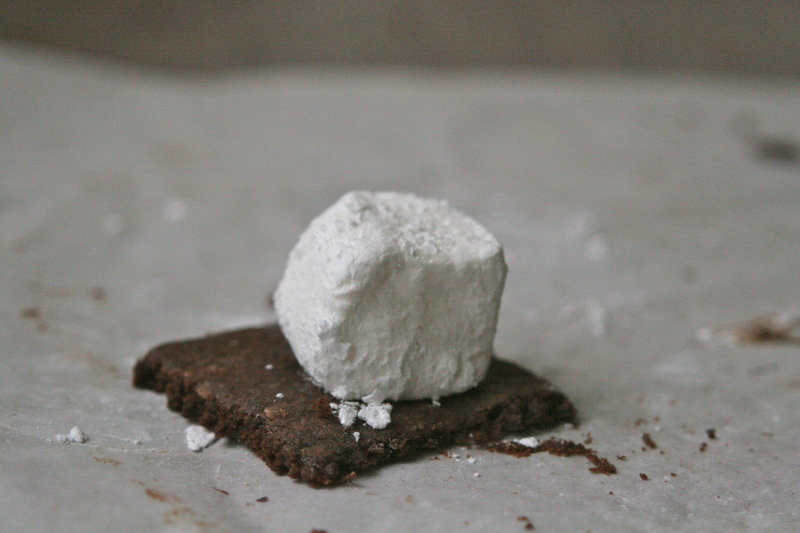 Or of course, you can roast one of your homemade marshmallows (a great way to use up some of the leftover egg whites you may have from a pasta-making session) pop on a few squares of your favorite chocolate (blowing a kiss to the people who make the 75% bar at Madecasse), and make the most incredible S’mores you will ever eat. 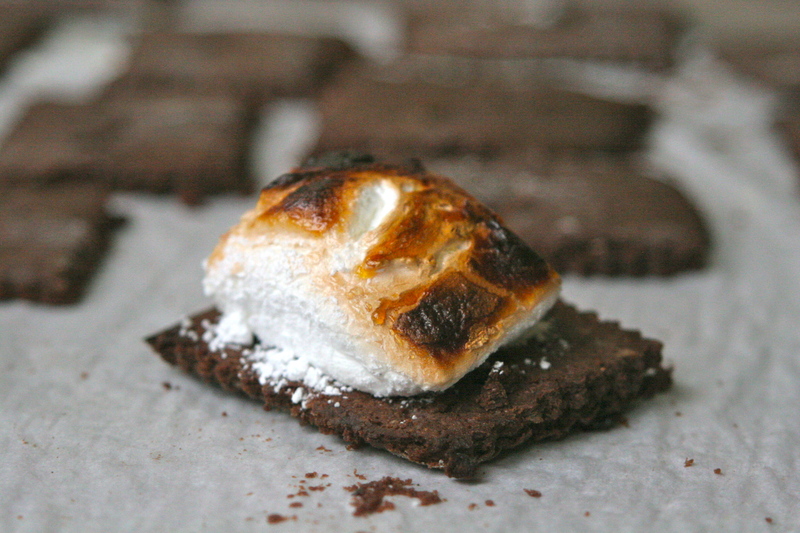 Prepare a large piece of chocolate atop one of two graham crackers. If you are doing this with fire, skew your marshmallow carefully with a fire-proof skewer and cook gently over the fire until it is gently browned and you think the marshmallow is going to melt and drop off of the skewer. Using one of the graham crackers, quickly scrape the marshmallow off of the skewer and onto the chocolate topped graham cracker. If you are cooking this in an oven or toaster oven, place one marshmallow on top of one of the graham crackers and toast until it is gooey inside and toasty outside. Top with a piece of chocolate and another cracker. Eat with gusto! Preheat the oven to 325F degrees. Whisk together the three flours, Dutch cocoa powder, baking powder, sugars, and salt. In a separate bowl, whisk together the honey and milk. Using a pastry blender, or two forks, blend in the butter to the dry mixture until little pea sized lumps appear. Add the honey-milk mixture and stir with a fork until it roughly comes together. If you shied on the side of less milk and the mixture does not come together, add a bit more. Prepare two cookie sheets with parchment paper. Fold the dough over onto itself six or seven times until relatively smooth. Split the dough into two parts. On the parchment of one cookie sheet, roll the dough out approximately to 12 x 14 inches, or until quite thin (1/16 inch). As noted above, if you like a softer, more brownie like texture, you can roll it out to 1/8 inch. Repeat with the other half on the other cookie sheet. Prick all over with a fork and cook for about 15-17 minutes, or until you can smell the baking chocolate. As soon as the cookie sheets come out of the oven, score the cookie dough with either a fluted pastry/ravioli roller, a pizza cutter, or a knife to cut into graham cracker shapes. Let cool completely and then remove from the parchment and use or place in an airtight container. Line the bottom of an 8×12 inch sheet pan with parchment and very lightly spray both the paper and the sides of the pan with a baking spray such as PAM. Do not overdo it. Place the gelatin in a both, whisk in the water, and set aside to soften. In a heavy-bottomed pot, combine 1 cup of the sugar with the corn syrup. (Recchiuti recommends an unlined copper pot.) Place over medium heat and cook, stirring occasionally with a wooden or silicon spoon, until the sugar melts. Continue to cook without stirring until the mixture reaches 240F degrees on a candy thermometer. In the meantime, whisk the egg whites, salt, and the seeds scraped from the vanilla bean in a standing mixer on high. When the whites form soft peaks, add the remaining 1 cup of sugar and continue beating. When the sugar syrup reaches 250F degrees, remove it from heat and stir in the softened gelatin. The syrup will foam up and almost triple in volume. Turn the mixer onto high-speed and slowly pour the syrup into the beaten egg whites. Aim for the sides of the bowl. Beat until the whites (not just the outside of the mixer bowl) are lukewarm to touch. Quickly scrape the marshmallow mixture into the prepared pan and spread it evenly to the sides. Let cool completely to room temperature. To cut the marshmallows, sift about 1/2 cup of powdered sugar onto a work surface in a rectangle the size of the sheet pan. Sift another 1 1/2 cups into a large bowl. Run a very sharp thin-bladed knife around the edge of the pan to loosen it and invert into the powdered sugar rectangle. Sift another 1/2 cup powdered sugar over the top (previously the bottom). Using a ruler to guide you, cut the marshmallows with a well oiled sharp knife and cut them into the shape you like. (I like 1 1/2 to 2 inch squares.) Use a pressing motion for success. After cutting, toss each marshmallow into the bowl of powdered sugar. Store in an airtight container at room temperature for up to a month. This entry was posted in Cookies, Dessert, Recipes for Egg Whites, Whole Grains and tagged black and white S'mores recipe, chocolate graham cracker recipe, desserts with egg whites, homemade chocolate graham crackers, homemade marshmallows, homemade S'mores, vanilla bean marshmallows, what to make with graham flour, what to make with leftover egg whites, when to use your best chocolate, whole grain chocolate cookie recipe, Whole wheat flour chocolate graham crackers. Bookmark the permalink. The caramelization on the marshmallow looks heavenly. 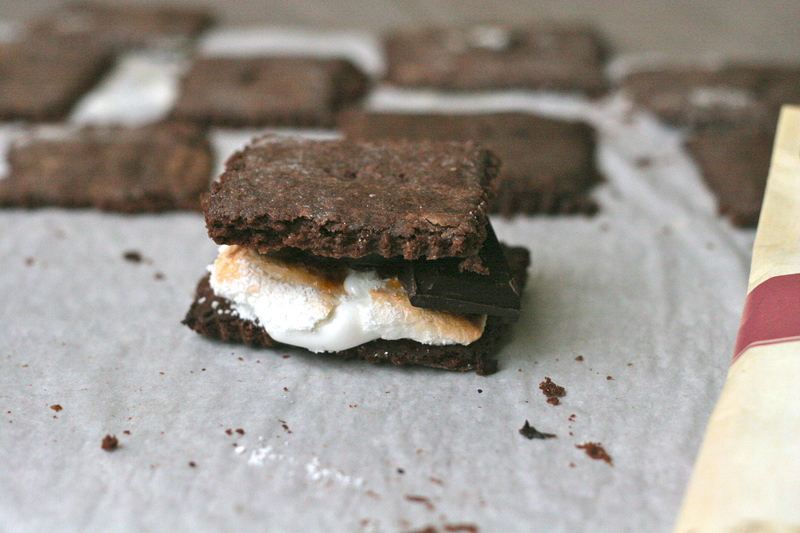 If I bring some esoteric music, will you make me these s’mores? !